Over at ReportingPoints, the AOPAPilot Blog, Nate Ferguson recently wrote a post asking whether the $100 hamburger should be renamed the $200 hamburger due to the rising cost of aviation fuel. For non-pilots, the $100 hamburger is slang for a flight in which a pilot is looking for an excuse to fly so he or she takes a short flight to a neighboring airport for a bite to eat, the cost of the flight and the burger were said to be about $100. There is even a book dedicated to the best places to get the proverbial $100 hamburger. Since I had the Cessna booked for a morning flight I opted to go in search of some breakfast. 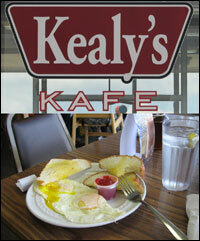 John Keating had written about a brunch destination, Kealy's Kafe, on FlyingChicago.com so I decided to check it out. The cafe is located in the terminal building at Janesville Southern Wisconsin Regional Airport. Janesville is just over 50NM miles away which means that the flight time could be logged as cross-country time that could be used towards the cross-country requirements for an instrument rating, something I would like to pursue in the future. I was excited, but also a little apprehensive about the flight. When I checked in with the Flight Service Station to get the weather I learned that I would encounter gusting crosswinds at both Janesville and upon my return to Chicago Executive. Luckily both airports have multiple runways, allowing me to select the runways that would minimize the crosswind factor of the winds. Enroute, I flew over Dacy Airport which offers two turf runways. Not far from Dacy Airport is Twin Garden Farms. They sell the best corn I have ever had, Mirai Corn. Each year in late Summer my parents drive out and pick up bushels of corn for the family. Seeing that it only took about 20 minutes to fly to Dacy, I might have to look into flying there this year and bring back some corn for the whole family. After a turbulent-at-times flight, I arrived at Janesville. The flight took about 45 minutes from takeoff to engine shutdown. When I arrived there was only one other airplane parked outside the restaurant. I seemed to have arrived at the right time, for pilots in the area getting there by 10am is the way to go. After my arrival a flight of seven Van's Aircrafts came in together. Following them were three other planes that arrived for brunch. I ordered two eggs and toast which was served promptly and were quite good. On the flight back I had a tailwind that allowed me to cut ten minutes off the return leg. The return flight went smoothly though I was a little worried to hear that Chicago Executive was reporting crosswinds and windgusts of 20kts and adding to that was a report of low level windshear. The main concern is that as you are preparing to land if there is a major change in wind direction you can immediately lose lift and therefore lose altitude rapidly. To counter the crosswinds and the concerns of windshear I opted to use only 20° (instead of 30°) and also flew a faster approach speed then normal. The plane bounced around a bunch on final but I was able to put the upwind wheel down first and then settle the plane safely on the runway. In the end the $4.95 eggs came out to be closer to the $150 eggs when you factor in the cost of the plane and fuel. So, I agree with Nathan at AOPA that it might be time to increase the cost of the $100 Hamburger. I think $150 - $200 might be more accurate in our current economy. Great photos! Do you find it hard to take them while flying? Maybe it's just me and my low number of hours, but I don't know that I could do that. Hey Perry - I find the key is to have an easy to use camera that has a digital display so you can operate it easily and quickly. Of course you also have to decide as the pilot when you feel comfortable taking a photo and when not to. If there is a lot of activity around the airport or a ton of radio communications going on the I would likely have not taken some of those photos. Safe flying! Some time before, I really needed to buy a good house for my business but I did not earn enough money and couldn't purchase anything. Thank heaven my dude adviced to try to get the credit loans from reliable bank. So, I did that and was happy with my consolidation loan. What a great post - fortunately for me my boss has to pay the $100 for the hamburger trip. Check out boredpilot com and leave something for the next pilot. I see a book in the making, The $200 Hamburger!